When we checked back into the JW Marriott Quito after the cruise, we were given a sheet of paper with the times for airport transfers depending on your flight time. As I've mentioned in my previous post, we had a 11 PM flight from Quito, so we didn't need to get to the airport until around 9 PM. We had asked the Celebrity representative if we could have a late checkout and he said that would be no problem. In the morning before we left for our excursion to Mindo Cloud Forest, we stopped at the front desk to ask if a late checkout time was possible. They said it was and asked what time we wanted to checkout. We explained that we didn't have to leave until 8 PM for the airport and they said that wasn't a problem. They told us that when we were ready to leave just come down and checkout and they'd call for the van to take us to the airport. After our tour we went back up to our hotel room, took showers and packed the last minute items in our suitcases. We went up to the Executive Lounge for some food and met a group of passengers that didn't have flights until the next day. We talked to them for awhile and then said our good-byes and went to get our luggage. We were still early, but figured we'd wait in the lobby. After checking out, we asked what time the van would be here. If you are ready to go now, we'll call them for you. A few minutes later, we were on our way to Quito Airport. We arrived at the airport and checked in with the airline. It is necessary to pay the exit tax, so we did that and got stickers to put on our boarding passes indicating that we had paid the fees. Since we still had some water bottles left, we sat in the lobby for awhile and finished our water. Just like back home, you aren't allowed to take bottled water or other liquids past security. It acutally is even more strict in Quito. You can still have the 3-1-1 bag for your personal liquids. We went through security and proceeded to the gate. Our flight was delayed due to weather elsewhere. At the gate, your carry-on luggage is searched by hand and every passenger is searched with the wand. You surrender your boarding pass when you pass this security checkpoint. No liquids, other than those in your 3-1-1 bag are allowed in the waiting area. Unfortunately, our flight was delayed for a couple hours. We could get our boarding pass back and go to the rest rooms or shops in the area. Each time you returned, you were searched once again. That got quite old, but we got used to it. Our plane finally arrived and we began the boarding process. We had connecting flights and would have had plenty of time between them. Now, we would only have enough time to claim our bags, go through customs, recheck our luggage and head to the gate. It worked out fine. The flights home were without incident other than the initial delay in Quito. We got home on time and returned to our normal activities. Celebrity Xpeditions did an excellent job from start to finish. From the time we stepped off the plane in Quito until the time we got back to the airport for our departure flight, everything worked like clockwork. They really know how to put a schedule together and execute on it. This was the most organized cruise vacation we've ever taken in over 20 years. We'd go back in a heartbeat, so if anyone has room in their cabin for two more people, let us know. After breakfast in the Executive Lounge of the JW Marriott Quito, we went down to the lobby to wait for our tour to Mindo Cloud Forest. The pickup time was scheduled to be 8:30 AM. It was almost 9 AM and we were getting worried. All we had was a credit card receipt from Celebrity Cruises for the tour. We spoke with the hotel concierge and she made a phone call. She was able to contact the driver who was stuck in traffic. He was at the hotel about 30 minutes later. We didn't know what to expect - we thought there would be a large bus with other people since that was what we had the entire time we were in Quito. It turns out we had a private tour in a mini-van. Our guide was excellent - we couldn't have asked for anything better. Mindo is world famous as a birdwatching destination but there are plenty of other activities to offer as well. Our day was filled with opportunities to see three of the popular natural sites - orchids, hummingbirds, and butterflies. 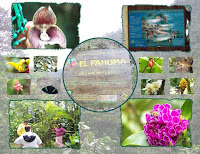 Our first stop was at the El Pahuma Orchid Reserve which is a 650 hectare (approx. 1,500 acre) cloud forest reserve located only one hour from Quito. We parked the van and waited for a guide from the Orchid Reserve to join us. Just across the street from where we parked is a trail which is very easy to navigate. Along this trail our guide pointed out various air plants including bromeliads, orchids, mosses and ferns. She spoke in Spanish about the various plants in the botanical garden while our tour guide translated for us. We were able to explore the gardens at our leisure taking time to photograph the beautiful orchids. 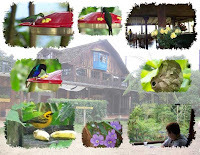 Ten minutes from the Orchid Reserve is El Siete Restaurant where we stopped to view the hummingbirds of the Pinchina region. Outside the restaurant are a handful of hummingbird feeders which allowed for up close viewing. We watched the birds for awhile and then went exploring one of the nearby nature trails. By the time we got back from our hike, the restaurant was ready for us. Inside there are large picture windows that allow for viewing of the forest area. There are more hummingbird feeders so we had plenty of visitors as we ate our meal. We enjoyed our meal and the hummingbirds. Our final stop was at Mindo Lago which has a handful of rustic cabañas (cabins) around a lake in peaceful surroundings. 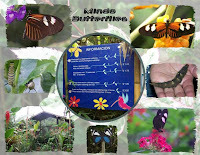 One of the attractions at this site is the butterfly house. In the evening, there is a "frog concert". It was starting to rain when we arrived at Mindo Lago, but that didn't stop us from visiting the butterfly house. Inside the butterfly house you can walk around the garden photographing and watching the butterflies that make this their home. In addition, our guide showed us the various of stages of butterfly growth since they breed the butterflies that live there. There were only a couple different butterfly species but we still enjoyed the visit. From Mindo Lago, we had about a 1.5 to two hour drive back to our hotel in Quito. We passed by the sights we'd seen our second day in Quito, such as the Mitad del Mundo (The Equator) Monument. One of the surprising things we saw was the price of diesel fuel in Quito - it was $1.03 per gallon. Back home we were still over $4 per gallon for all types of gasoline. One has to take into consideration that the average wage earner (laborer) only makes $2 - $3 a day. This is a very poor country, but at the same time, it is very beautiful and worth the visit. Perhaps tourism can help Ecuador increase the quality of life for at least some of the people. If you have the time while in Quito, I would definitely recommend adding the Mindo Cloud Forest to your must see locations. We were happy that we had the full day after the cruise to enjoy this private tour. Sunday, September 7th, we were back in Quito following our 7 days on Celebrity Xpedition. The transfer by motor coach from Quito Airport took about 15 minutes. We arrived at the JW Marriott Quito where we checked back into our hotel rooms. We had time to relax before departing by motor coach for a shopping trip to a local craft market. Since our flight on Monday wasn't until 11 PM, we would have the entire day to spend in Quito. We spoke with the Celebrity representative and arranged a private tour to Mindo Cloud Forest. I'll talk about this tour in my next post. By the time we got up to our hotel room, our bags arrived from the ship. The hotel did a fantastic job with luggage throughout the entire trip. We never had to deal with the bags ourselves. As far as I know, everyone had all their luggage without incident. We went up to the 9th floor to the Executive Lounge and had something to drink and some snacks before heading out on the shopping activity. We met in the lobby and boarded the motor coaches for a short ride into Quito. The coaches dropped us off by the market and the Celebrity representative said they would return in an hour to take us to another location. They told us that the crafters expected us to negotiate on price and set us loose. There were several rows of crafters in a covered area. Each aisle had crafters on both sides in small booths. There was just enough room to navigate down the aisles. As we'd walk down the aisle, the crafters would try to get your attention to look at their merchandise. Many of the booths carried the same products. The majority of the merchandise was handmade. You could get handmade scarfs, jewelry, religious and other items. I found some earrings that I liked. They were only 3 USD. Keep in mind that Equador uses US dollars which makes it quite easy to shop there. I didn't have the heart to negotiate, so I paid for my earrings and went further. We had already done some shopping earlier in the week, so we didn't buy much at the market - just a few items. Boarding the motor coaches one more time we headed to a more exclusive gallery. There were various art pieces and sculptures. Several of the items peaked our interest, but we really didn't have the room for any large boxes, so we simply walked around the gallery admiring the craftsmanship. Some people were having items shipped home and others were taking the boxes with them. After an hour or so, we boarded the motor coaches again for our return to the hotel. That ended the escorted portion of our day in Quito. Dinner was at our leisure in the hotel. We had a choice of a chicken or beef entree. We were hoping to meet another couple but were unable to reach them. So, we asked another couple from our cruise to join us. More people started arriving at the restaurant and eventually most of the passengers were there. We had the restaurant to ourselves complete with entertainment. It was an enjoyable meal. Following the meal it was time to say our good-byes to all our new friends. Some of the people were leaving as early as 4 or 5 AM for their flights home. Most likely we would only see a few people on Monday. It was a bittersweet moment as we said our good-byes. With a small group like this, you really get to know people. It was like saying good-bye to friends we'd known for years. After dinner, we just went back up to our room to relax. In my next post, I'll talk about our final day in Quito. 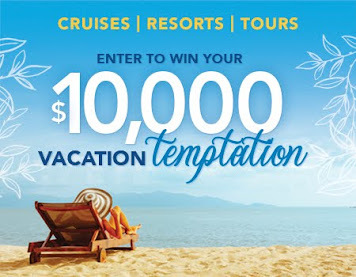 Day 10 (Sunday, September 7th) was disembarkation day from Celebrity Xpedition. We had breakfast in Darwin's Restaurant, went back to our cabin to get our bags, and went up to deck 4 to wait for our departure. The Zodiacs took us back to the same pier where we had begun our cruise just a week earlier. When we arrived at the pier dock, there was a sea lion resting on the bench. It was almost like he was waiting for us to arrive and had fallen asleep. People (including yours truly) were sitting next to the resting sea lion and having their picture taken while we waited for our buses. 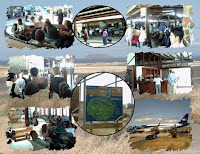 The buses took us to Baltra airport where we had some time to shop in the local stores before being called to go through security and into a VIP waiting lounge. Once inside the lounge we were able to get refrehsments while waiting for the charter TAME flight to arrive from Guayaquil. The VIP lounge didn't have enough room for all of the passengers, so the airport staff opened another lounge which wasn't currently in use so everyone had a place to sit. It was quite warm in the building since it is not enclosed. People were standing around outside the building watching for our plane. My husband even took a video of our plane landing. Once the plane landed, the airport personnel did ask people to go inside so that the disembarking passengers could make their way into the airport building. 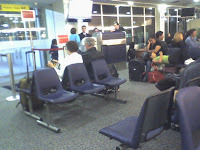 The plane was serviced and it was time for us to board for our flight to Guayaquil and then on to Quito. Just as we did on the flight to Baltra, we had a refueling stop in Guayaquil. That is where the Xpeditions staff that were on our flight departed for the most part. We all clapped for them as they exited the plane. They really were a fanatastic group of people. Celebrity Xpeditions staff and the hotel staff handled all of our luggage. The luggage was delivered to our hotel room at the Quito Marriott shortly after we arrived back at the hotel. We picked up our additional bag from the bellman and went up to our room. I'll talk more about the rest of our day in Quito in my next post. Food onboard Celebrity Xpedition was as plentiful and as good as on the large ships within the Celebrity fleet. When we'd return from our activities, there would be fresh juices or soda and snacks waiting for us. 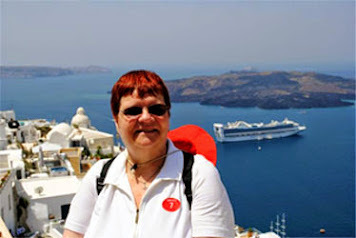 Our initial afternoon onboard Xpedition was similar to any other cruise ship. A welcome aboard lunch was served in Darwin Restaurant on deck 3. 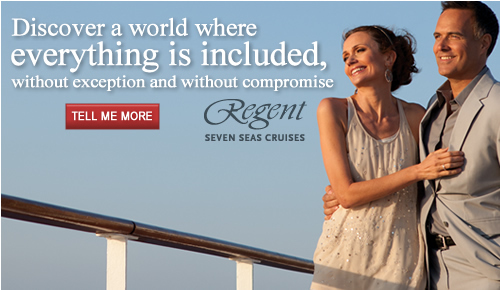 There are no pre-assigned seating arrangements throughout the cruise. 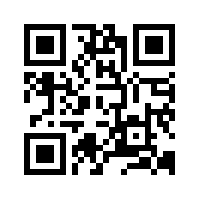 This is a great way to meet new people and make new friends. Breakfast and lunch were served buffet style in Darwin Restaurant. In the morning, coffee and light breakfast was also available out on deck at Beagle Grill. 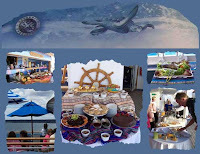 There you could sit on the aft enjoying your food and drink while taking in the scenery of the Galapagos. Lunch was usually served in Darwin's Restaurant and Beagle Grill (weather permitting). The lunch buffets included Oriental, Italian, Around the World, Mexican and Galapagos cusines. Dinner was served in Darwin's Restaurant. These were sit-down meals where you ordered from the menu just like you would on any traditional dining room onboard a ship. 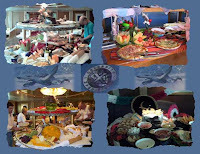 The menus consisted of appetizers, soup, salad, main entree, desserts, ice cream, and cheese selections. Click on the pictures for sample menus from two evenings. One evening we had a barbeque out on deck at Beagle Grill. The chefs were cooking steaks, shrimp, ribs, and other items. We had a fabulous meal under the stars complete with your choice of red and white wine or beverages of you choice. All liquor is included as I've mentioned before, so don't be afraid to ask for what you like. We enjoyed the majority of the meals. There was only one evening where the chicken in wine wasn't to our liking. Just like on other cruise ships in the fleet, you can order whatever you want and have as much as you want with your meals. If you don't like something ask for a replacement; the crew went out of their way to make sure you enjoyed your meals. They are very hard working and pleasant. One of our waiters had just started that week. He was one of the best waiters we've had on a cruise ship. We even complimented him telling him we wouldn't have known this was his first time onboard. 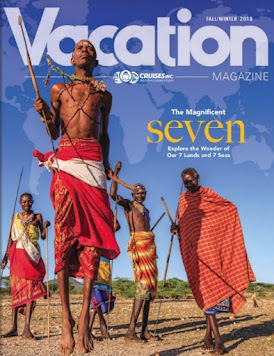 Before we deapart the Celebrity Xpedition, I'd like to tell you more about the ship and life onboard during the past seven days. She is small compared to the megaships that are being built today, like Celebrity Solstice for example. Xpedition weighs in at 2,842 Tons and has a capacity of 92 Passengers. It is 296 feet long (about the size of a football field). Despite the small size, there still are multiple locations to gather with the crew and your fellow passengers. Because of her size, and the size of the passengers and crew, you can't help but become a n extended family by the end of the cruise. The first location that you'll become familiar with once you board the Xpedition is Discovery Lounge. 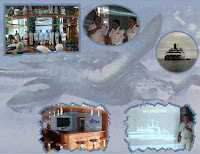 It is the hub of the ship serving as meeting room, cocktail party room, and entertainment center. For those wishing to stay in contact with the outside world, it also serves as the internet cafe. Before dinner each night there was a cocktail party in Discovery Lounge along with a briefing about the next day's activities. 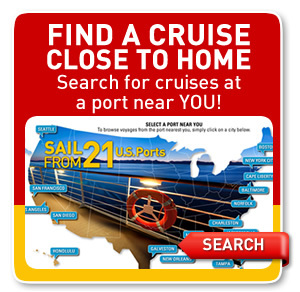 Unlike other ships, you don't have to pull out your cabin key to pay for your drinks - they are included in the cruise price. You can try the special of the day or enjoy your favorite drink. Mine drink of choice while cruising is a chocolate martini. I am happy to report that the bartenders made excellent martinis (as well as many other drinks). For the past ten years, one of the first things we do is check out the spa once we get onboard. Xpedition does have a spa and fitness center. There is a hot tub, sauna, and massage room along with treadmills, stationary bicycles and other fitness equipment on the Sunrise deck. My husband and I both booked Sweedish massage appointments for one of the afternoons. Later in the week we spent some time on the Sunrise deck in the hot tub and laying on one of the lounges. We didn't use the exercise equipment since we figured we were getting enough of a workout on our activities. 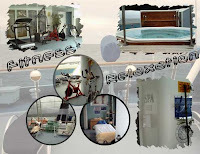 Whether you want to relax or workout, the facilities on the Xpedition should be satisfactory. 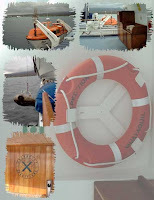 Safety is an important concern on any cruise ship and the Xpedition does have lifeboats in addition to the Zodiacs which provided transportation for all our activities. You may be wondering about the restaurant facilities. We'll talk about food in my next post. For now suffice it to say that this cruise had all the amenities of larger ships including parties, musical entertainment, and several enrichment opportunities. Saturday night and it's time to say farewell to the crew of Celebrity Xpedition. Captain Fausto Pacheco hosted a Farewell Cocktail party in Discovery Lounge before dinner. As is customary on all Celebrity cruises, the staff is called on stage to be recognized by the passengers with a round of applause. Our Cruise Director, Jorge, served as MC for this event. The farewell greeting was from the heart: "During these past 7 days, we have sailed with you around the Enchanted Islands, covering a total distance of 611 nautical miles. It has been a pleasure to host you in the beautiful and unique Galapagos Islands. We sincerely trust that you have enjoyed this experience on board the M/V Xpedition and we wish you a happy and safe journey home. Thank you for being with us." At the conclusion of the captain's greeting, the entire staff of the Xpedition circulated through Discovery Lounge personally thanking each of us for sailing with them. It was a very emotional experience for all of us. We've been on many cruises, but never before have experienced a farewell like this. Farewell dinner was served following the cocktail party. The meal consisted of steak and lobster. The wait staff conculded the meal by parading through Darwin Restaurant with flaming baked alaska. The evening concluded with a Local Folkloric Show in Discovery Lounge. Local folkloric performers had come onboard to treat us to music and dancing complete with colorful native costumes. Many of the passengers joined in the dancing as the evening progressed. 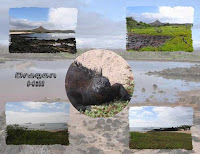 It was a very enjoyable conclusion to a wonderful week in the Galapagos Islands. We were truly sad to see this cruise end. 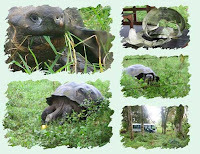 The afternoon activity consisted of a bus ride to the highlands of Santa Cruz to observe giant tortoises in the wild. 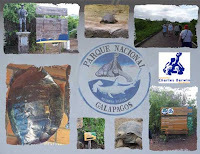 Both the Charles Darwin Research Center and this tour were offered in the morning and afternoon. We opted to do the research center in the morning. The Zodiacs dropped us off at the landing pier in Port Ayora where we made a short walk to a waiting mini-bus. After a short drive through the highlands, we arrived at a farm. There was a light rain falling, so we were happy we had our nylon jackets and walking shoes. We began walking along a path which was muddy from the rain that had fallen earlier. Since we had our walking sticks with us, we didn't have any problems navigating along the path. The first thing we saw was the entrance to a lava tunnel. We made our way down the path and went inside. 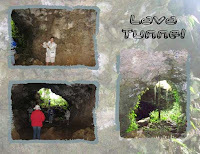 After a few photos, we exited the tunnel and started on our quest to find giant tortoises who were roaming the farm freely. It didn't take long before we saw our first tortoise grazing in the grass. He was just laying in the grass pretty much ignoring us. After a while, he lifted his head to look at us, but then went back to his original position, resting in the grass. We headed further through the grass and before long we saw one giant tortoise and then another. There were about five of them in a relatively short distance. Some of them were moving slowly through the grass, others were just resting in the grass, and a couple of them were eating the vegetation. There is a fenced in area on this farm, but the tortoises have plenty of room to move about freely. 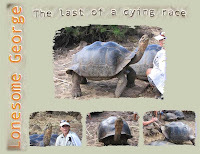 Below is a video taken near the fence of a giant tortoise having lunch. It consisted of a ripe grapefruit that had fallen from one of the trees. This was a fitting conclusion to our excursions in the Galapagos Islands. The giant tortoises are probably the most widely known creatures of the Archipelago. It was amazing to be able to observe them in their nature habitat without any barrier between them and us. They were not bothered by us at all. We have several photos and videos to remember them by. 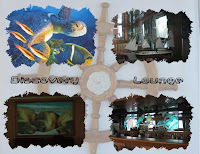 Day 9 (Saturday, Sept. 6th) finds the Celebrity Xpedition anchored at Puerto Ayora, the largest town in the Galapagos. It is located on Santa Cruz Island, the second-largest island in the Galapagos and hub for tourists. In 1959 (the centenary year of Darwin's publication "The Origin of the Species"), the Ecuardorian government declared all the islands, except areas already colonized, as a national park. In the same year, the Charles Darwin Foundation (CDF) was founded with a primary objective of ensuring the conservation of the unique Galapagos ecosystems and to promote the scientific studies necessary to fulfill its conservation functions. We took a short bus ride through the small town of Port Ayora, ariving at the entrance of the Charles Darwin Research Station. It was quite a walk to the actual start of the research station from where the bus dropped us off. The path was patio blocks at first but then changed to a dirt trail. We were concerned because one of the passengers in our group was on crutches and we didn't think she'd be able to make the walk. We were happy to see her waiting for us at the end of the path - there is vehicle access for handicapped and official vehicles. One of the naturalists took us inside the tortoise conservation building where we saw displays on tortoise exploitation, conservation, and ecology. She also explained the captive breeding program which began in 1962. Since that time many tortoises have been repatriated to their original islands. Wardens of the Galapagos National Park Service collect eggs and hatchlings from tortoise nests on Pinzon, Santiago, San Cristobal, and Santa Cruz Islands and bring them to the center for protection and rearing. Eggs from the nests of Espanola tortoises at the center are also gathered. Eggs are placed in incubators. The hatching process usually takes about 3 days. After an incubation of about 4 months, a tortoise finally breaks free of its eggshell. A yolk sac attached to its stomach provides nourishment to the hatchling in its first few weeks of life. Upon emerging from the egg, hatchlings are kept in dark boxes for two to four weeks, which simulates the time spent in the natural nest chamber. Each tortoise is given a colored identification number. The colors represent each tortoise's "home island". Baby tortoises are weighted, and measured for length and girth. The hatchlings are then moved to outdoor corrals, where they live and grow for up to two years. You can see these corrals in the photos above. Lonesome George is the last known individual of the Pinta Island Tortoise, one of eleven subspecies of Galapagos tortoise native to the Galapagos Islands. He has been labelled the rarest creature in the world, and is a potent symbol for conservation efforts in the Galapagos and internationally. It is thought that he was named after a character played by American actor George Gobel. George was first seen on the island of Pinta on 1 December 1971 by American snail biologist Joseph Vagvolgyi. The island's vegetation had been decimated by introduced feral goats, and the indigenous tortoise population had been reduced to a single individual. He was relocated for his safety to the Charles Darwin Research Station. George is estimated to be 60–90 years of age, and is in good health, however efforts to get him to mate with two females of a different subspecies from Wolf Island have failed. Research continues to date, and it is hoped that a pure Pinta tortoise lives among the 2,000 tortoises on Isabela. Will George's subspecies become extinct? Hopefully not, but regardless of what happens to this one animal, let him always remind us that the fate of all living things on Earth is in human hands. Back onboard after our morning excursion, we had lunch which consisted of a Mexican buffet. 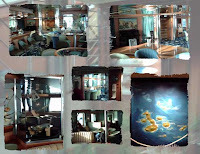 Following lunch there was a video presentation about the Galapagos Islands in Discovery Lounge. The afternoon activity that we chose was the zodiac ride to Dragon Hill where a wet landing was made. We landed on a small beach which offered access to two different snorkeling spots. I stayed on the beach and took pictures while my husband got into his wet suit for the last time and did some snorkeling. The water was warm near the beach but as you made your way futher out towards sea, the temperature dropped considerably. This is due to the various currents that run through the Galapagos Islands. The water was also pretty murky. My husband did manage to see a stingray, a white-tipped shark, and some other fish. The visibility wasn't the best, so he didn't stay in the water very long. 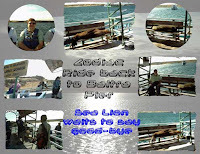 We all boarded the Zodiac for the return to the ship. Since this was the final snorkeling activity for the week, once we got back on deck, we took out our personal belongings from the bag and turned in our gear. It had served us well during the week. Day 8 (Friday, September 5th). Our day began as usual with breakfast in Darwin's Restaurant. The morning excursions began at 8 AM with a Wet landing at James Bay on Santiago Island. This was the high intensity activity. The medium intensity activity consisted of a short Zodiac ride and wet landing at James Bay. Santiago Island is the fourth largest island found in the Archipelago. In the 1930s a group of people attempted to colonize this island. "The Enchanted Islands" was a book published in 1947 detailing their experiences on the island. Both the high and low activities returned to the landing beach for swimming and snorkeling. Unfortunately, I wasn't feeling well and decided to stay onboard the Xpedition. My husband went and had a marvelous time both on the Zodiac and snorkeling. He joined another couple so that he didn't snorkel alone. It is always best to be with at least one other swimmer while in the water. The fish and other marine life were plentiful along the reef which was an easy swim from the beach. The highlight for him was the sea turtle that swam right up to him while he was snorkeling. 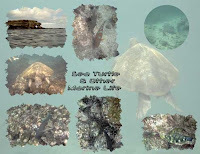 He got pictures of the sea turtle approaching and swimming away from him. At one point he also heard a bull (sea lion) nearby but by the time he turned, it was gone. Apparently he had gotten close enough to the sea lion and it let him know. If you haven't snorkeled before don't worry. The various snorkeling activities that take place from the beaches are not hard. If you get tired, you can easily get back to an area where you can stand up and rest. I would stay away from the advanced snorkeling if you are a beginner. We have snorkeled quite a lot over the year, but I still consider myself to be a novice and was quite comfortable with the various snorkeling activities we did in the Galapagos. I've talked about Isabela & Fernandina, the highlights of Day 7, but neglected to mention one special event that happened the night before. 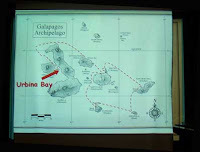 As Celebrity Xpedition made its way from Bartolome Island to Urbina Bay (Isabela), the ship crossed into the Northern Hemisphere. As usual, we had our evening briefing in Discovery Lounge. The Cruise Director explained the ship's course for the evening and the next day. He also invited us to a special event being held after dinner back in Discovery Lounge. 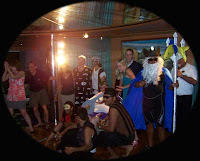 As is tradition onboard Celebrity Xpedition, on the evening that the ship crosses the Equator, a special party is held in commemoration of this event. It is the "Crossing the Line" party which is held at 10 PM. Everyone gathered in Discovery Lounge for the party just before 10 PM. Similar to the countdown on New Year's eve, we anxiously awaited the actual crossing of the Equator into the Northern Hemisphere. We were told a special guest would appear at the moment we crossed. A robe was placed on my shoulders, a crown was put on my head, and I was seated in front of the rest of the passengers while my subjects were selected. King Neptune wanted to please me, so the selected subjects had to entertain me until I was satisfied. The Celebrity Xpedition staff really made this evening special. Later in the cruise, we would receive our certificate of crossing signed by the Captain of the vessel. I can now add this to my list of treasured memories of our cruises. As I mentioned in a previous post, my husband and I split up for the afternoon excursions on day 7. Since I had stubbed my toe in the morning, I didn’t think I’d be able to do any extensive hiking. Here is what I missed by not doing the high intensity activity. Arriving by Zodiac on Fernandina Island, the group was met by a curious sea lion who was walking along the concrete dock landing area. After stopping for a photo opportunity, they continued along the path where they met the first of many Marine Iguanas which populate the island. In fact, Fernandina Island has one of the largest "colonies" of iguanas in the archipelago. The Marine Iguanas don't seem to be bothered by humans at all. Walking along the volcanic terrain several groups of iguanas were spotted "hanging out" together. The scene looked like a typical beach scene with all the natives close together sunning themselves. The iguanas also liked congregating by the poles that marked the trail. 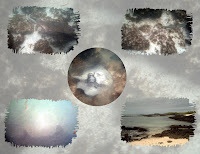 In some areas, they were looking out to sea. You have to wonder what they were thinking about as they gazed upon the group or when they simply looked out into the sea. Good hiking shoes and a walking stick are very helpful on Fernandina Island. The terrain varies between crushed volcanic rock and very uneven volcanic rock. Despite the uneven terrain, it is not very difficult to navigate around the island. In addition to the iguanas, which were plentiful, there were several sea lions and Flightless Comorants. Sally Lightfood and other species of Crabs could also be found along the path. I've only included a sampling of pictures from the stop at Fernandina island in this post. 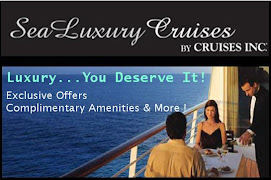 See our Cruise Vacation website for additional photos. Day 7 was another fantastic day in the Galapagos. Despite my injury in the morning, both my husband and I were able to explore this very interesting island and the surrounding area. 10 ... 9... 8...7...6...5...4...3...2...1... Happy New Year 2009!! A warm greeting to all my faithful readers and to those of you joining for the first time. I wish you many happy, healthy and prosperous days in this brand new year. May the year be filled with many sunny days, warm ocean breezes, visits to cruise ports, and relaxing sea days aboard a cruise ship. Looking ahead .... As in most years, there are plenty of destinations to chose from when planning your 2009 cruise vacations. Alaska and Hawaii mark their 50th anniversaries of statehood this year, so I would recommend putting those on the top of your wish list. 2009 is the year of the new cruise ships. The first ships will be introduced in April with additional entries in the Summer and Fall. The list includes Costa Luminosa, MSC Splendida, Costa Pacifica, Celebrity Equinox, Seabourn Odyssey, Carnival Dream, Project F3 from NCL, Silverseas Spirit, and Royal Caribbean's Oasis of the Seas. This is quite an impressive list of new vessels. Many of you love sailing the inaugural year; others of you may never have done so. Why not give it a try this year? In upcoming columns, I'll provide additional information about these new ships. 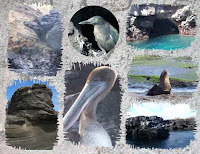 First on my list of topics is the conclusion of our Galapagos cruise. 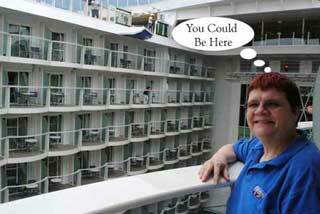 I'll also talk about our recent Alaska cruise as well as other surprises. Be sure to visit often. If you have burning questions about a cruise topic, send me an email and I'd be happy to discuss them in future columns. Again, Happy New Year to all and Happy Cruising.